It’s hard to believe I’ve been at Google for over two years now. The journey continues to be meaningful and full of insights. After one year, I was inspired to write about my takeaways as a new design leader. Now, two years in, I’m inspired to celebrate the passion of the community of people I have the pleasure of working with. Last month, I attended Google’s first-ever internal UX Women’s Leadership retreat. 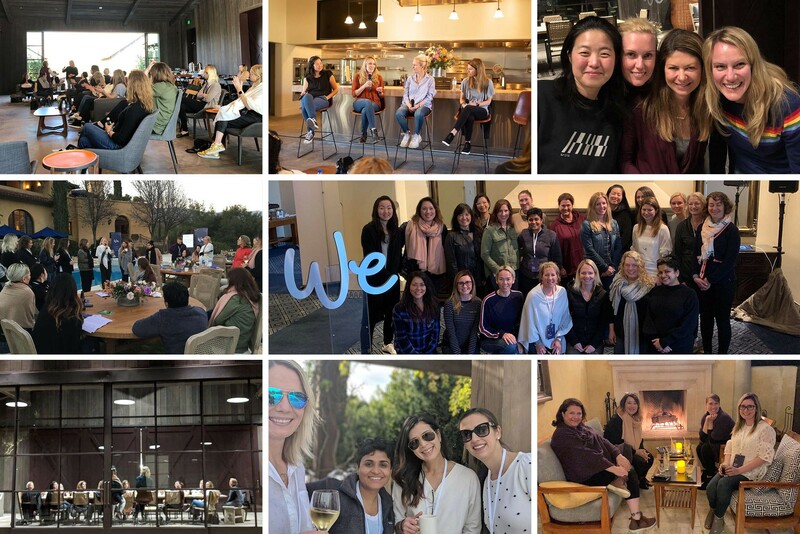 It was an opportunity to spend two days with women leaders across the company to connect and learn from one another. I tend to go into these kinds of events feeling optimistic and anxious. The invite list included women responsible for the design of Google Search, Ads, Hardware, Maps, Gmail, and more. I was excited to meet many of these women for the first time, and to get to know others better. But there was also the inevitable stress and guilt that comes with stepping away from work for a couple of days. The two days were so impactful that I wanted to share some of what I learned so that others might seek similarly inspiring experiences to support their communities. I believe we should celebrate and share these gatherings and put aside feelings of unworthiness or guilt. So in that spirit, here’s what I walked away thinking about. I once went to a talk where the speaker said, “If we all wrote down our problems on a piece of paper and put them in a hat, and you could pick one and trade it for your own, you’d be asking for your own problem back.” The point is that we don’t always know the path that other people walk. At our event, I was part of a panel discussion with the most senior attendees that explored this same theme. Universally, we all felt like imposters at times, and had significant challenges in our careers. After the panel, three women came up to me and said, “Wow, we thought you all had everything figured out. It’s good to know that executives are human too.” The sentiment was that it was empowering to know that everyone struggles sometimes. Just because you’re a VP doesn’t mean you solve all problems with confidence and ease. Everyone doubts themselves sometimes; that doesn’t mean you’re not a strong, capable leader. I’ve spent so much of my career demonstrating that I have it all together and wearing a proverbial suit of armor. As a woman, I didn’t feel that I could let my guard down, for fear it’d be seen as weakness. At the retreat, the vulnerability that the women showed was contagious — and a sign of true bravery and strength. I found myself talking about a particularly low point earlier in my career, where I felt I was failing at work. On top of that, my marriage was falling apart. What caught me off guard was how empowering and freeing it was to talk about those difficult times. In sharing I found deeper connections with my colleagues — many of whom had similar experiences. Who knew that you could ultimately feel stronger by admitting that your life is sometimes crap? Your colleagues can be your support community for both professional and personal matters. Opening up makes us all more relatable, and can forge deeper connections that benefit all aspects of your life. Right before the event I found out I had shingles (which is typically correlated with stress). I had to follow a doctor’s order of rest, and rest was all I could do because of major pain and discomfort. After several days, I was feeling better and decided to attend. The retreat involved not only sharing and challenging our thinking, but also exploring opportunities to better understand our mind-body connection. I had my first sound bath experience, which reminded me of the importance of letting both the body and the mind get rest. I learned breathing techniques that allowed me to just let go and relax. As a runner and cyclist, I have always relied on exercise for relaxation, so the exploration of techniques that require stillness was new and welcome. Making time for both my brain and body makes me a better leader. I’m impatient. If I can’t figure something out, I assume someone else might already have the answer. I was surprised how many women expressed their hesitation about asking for help, for fear of being perceived as a burden—or worse, stupid. I’ve found that in most cases, people are flattered that you thought to ask, and that you’d seek out their advice or input. To practice asking, we held coaching circles. In groups of three, we asked people to share some of their toughest problems with their colleagues. People left the session with really practical advice and guidance because they found that others had experienced similar challenges. If you’re impatient like I am, being open to asking questions is the quickest way toward a solution, with the added benefit of allowing you to connect personally with the people around you. Many of the women at the offsite shared a sense of guilt for simply being there. It somehow felt indulgent. Shouldn’t we all be at our desks? By the end we universally agreed that taking the time to get together was valuable. I’d been at Google for two years and had not yet met many of these women. In two days, we built a community and connections that will bring us great benefits back at the office. Talk about efficient networking! And let’s be real — our male counterparts have been taking time to build their network through activities like sporting events or after hours socializing without a sense of shame. As women, we too should celebrate the value of gathering and creating community. Putting that guilt behind me was empowering. I replaced it with gratitude. I was amazed at how vulnerability and sharing could lead to connections and problem solving that wouldn’t have happened in the office. Because we all shared the commonalities of being women UX leaders at Google, we could come to the event and focus on being ourselves. There was a feeling of safety, created by our commonalities. We agreed that without this combination, we might not have had the same outcomes. I left knowing I have a group of women who have my back — an amazing feeling that I hope to extend to my team of women (and men) at work and to the broader community.